Greig Roselli: Billy Elliot, Anatomy of a Scene: "You Can't Take That Out on a Junior Ticket"
Billy Elliot, Anatomy of a Scene: "You Can't Take That Out on a Junior Ticket"
Stephen Daldry directed Billy Elliot (2000), written by Lee Hall, now a Broadway Musical, about a young boy's persistent desire to be a dancer despite the disapproval of his overbearing, but in-the-end loving father (Gary Lewis). Sped on by his indomitable, but cranky teacher, Mrs. Wilkinson (Julie Walters) Billy deals with the death of his mother and the stark reality of living in an oppressed coal mining town in England circa 1984. The film is set during the coal miner's strike when Prime Minister Margaret Thatcher sought to cripple the colliery unions that were seen as a road block to a conservative economic strategy. The film is filled with stark images of a life with police barricades and protest riots. However, the film chooses not to depict Billy's life as completely bleak. The scenes are shot in bright tones which seems to protest against the otherwise somber historical background of the coal miner riots. Billy, played impeccably by the then thirteen-year old Jamie Bell, has been secretly attending ballet lessons while his father, a coal miner, thinks he is at boxing lessons. The family lives on a tight income. Both his father and brother, both coal miners, are on strike. His father uses the small allowance he does have to send his son to lessons. 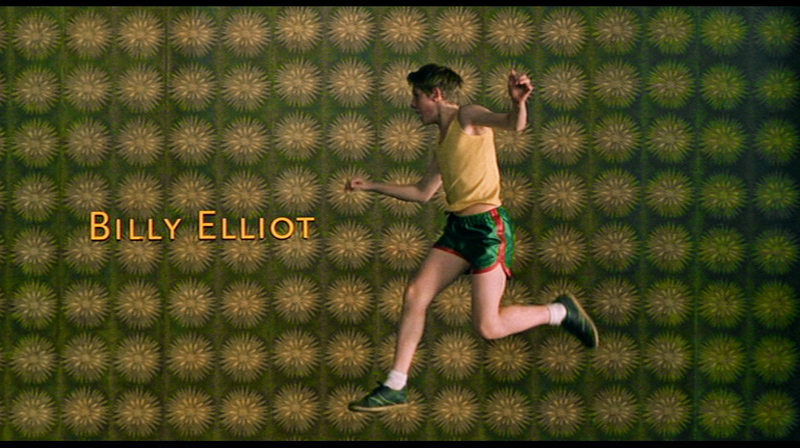 Billy leaves the house with boxing gloves around his neck, concealing his ballet shoes in his duffel bag. The film is thematically concerned with creative freedom and the personal satisfaction that comes from following an artistic dream. But, the film is also aware of the brutal reality of society and its rather cold resistance to personal fulfillment. The question seems to linger, how does a working-class boy like Billy find liberation from a society that is not interested in artistic expression? How many working-class boys become dancers? 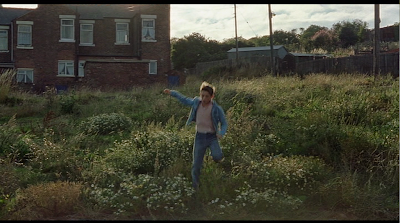 The film uses the miner's strike as both an example of "spitting in the face of authority" but also a grim portrait of a town where a boy wanting to be a dancer would be seen as ludicrous and counter-productive. 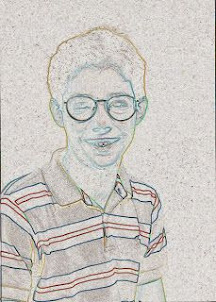 In fact, the casting directors had difficult finding a Billy. They wanted an unknown actor instead of a rising child star. Thousands of boys from the northern UK were screened, until finally Bell was discovered. Bell, who was born near the area where the film is set, plays the character of Billy achingly spot on. Bell does such a great job of being Billy it is hard not to think that the character is not far removed from the actor. Bell pulls off the emotional turmoil of a troubled, angry boy along with the poignant expression of a budding brilliant dancer. Billy pays a visit to the bookmobile to clandestinely research more information about the art of dancing. The soundtrack is T. Rex's Bang-a-Gong. We see Billy rushing through a field of wildflowers dressed in clothes that are obviously two sizes too small for him. 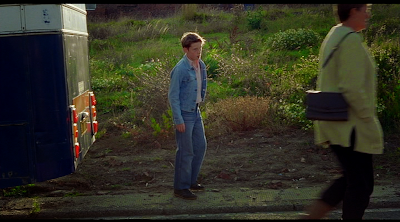 The cinematography constantly reminds the viewer of the lower middle-class reality of Billy's hometown of Everington. In the background, modest brick homes seem to line up against low-grade industrial shacks. The town does not have a library building of its own. 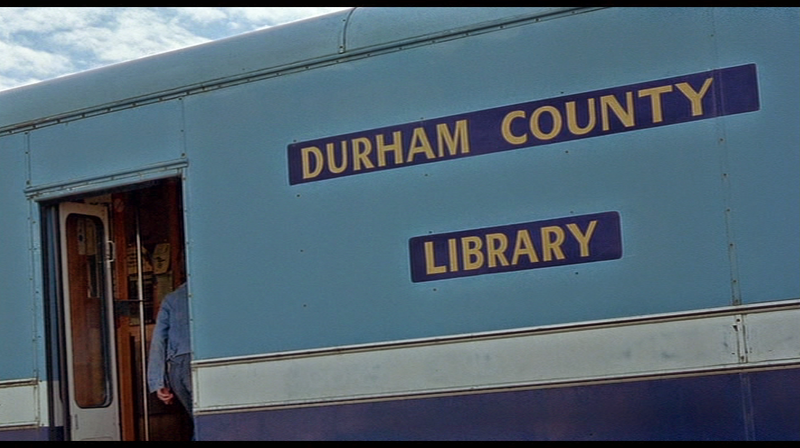 The bookmobile is its only branch as can be seen from the painted sign on the bus: "Durham County Library." 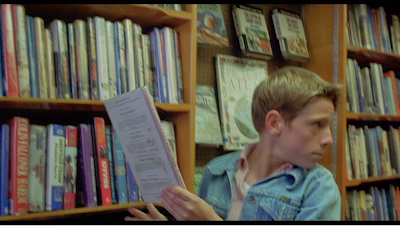 Billy eyes quickly the one book he is looking for: a book of ballet moves. We realize at this point in the film that Billy is drawn to the electricity of dance. Seconds before, in the previous scene, he reveals to his best friend Michael (Stuart Wells) that he has been going to ballet lessons. He seems to be emboldened by his ballsy ballet teacher who tells him when he confesses he may be called a sissy if caught at ballet, "Well, just don't act like one." 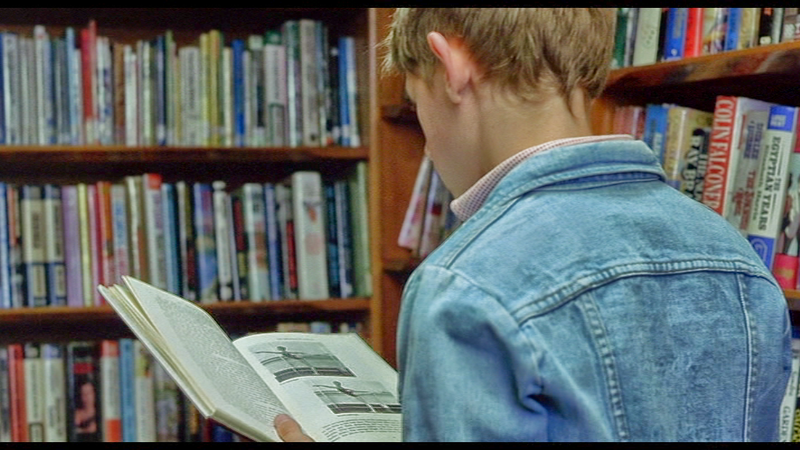 Here in the library, the viewer is faced with a few realities of the world Billy lives in. His world is one very much constricted and regulated. The life of the small town is virtually an unchanged one where everyone knows their role, both in the social sphere and the economic. For a moment, for a brief second, the camera hovers over Billy's shoulder as he peruses the pages of ballet position he so eagerly wants to learn. For a moment, it is as if he is alone. But, the rapture of his library moment, the seeming bounty of human knowledge is curtailed abruptly by the rash voice of the librarian, "I don't know why you're looking at that." Billy turns back to see the stern librarian, primly dressed in a light blue dress recording library records at her desk (or rather, the helm of the bus). "You can't take that out on a junior ticket." The T. Rex song ceases. The librarian's words are law and Billy does not protest. No one protests in this town. Except for the miners. And Maggie Thatcher will make sure they are punished. 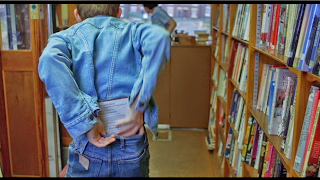 The scene drives home the message that the library, like most of the world Billy inhabits, is obsessively concerned with roles and permissions, instead of the free exchange of knowledge, which is meant to liberate people, not hold them back. The camera at this point has followed Billy into this restricted world. And for a moment we watch him succumb to this world's rules and regulations by dutifully putting the book back onto the shelf. He is not old enough to learn about ballet. The scene is univocal. There is no conversation. The librarian returns to her work and Billy, dejected, is about to depart. But fate intervenes. We watch the librarian's face as she shows no sign of relenting in her policy. Then, a disruption occurs on the street and the librarian is momentarily distracted. A protester runs down the street evading a police car. He stops in the middle of the road and moons the oncoming car. The librarian shows a Puritan sign of shock and attempts to return to her work but is intrigued by the obvious perversion on the street. 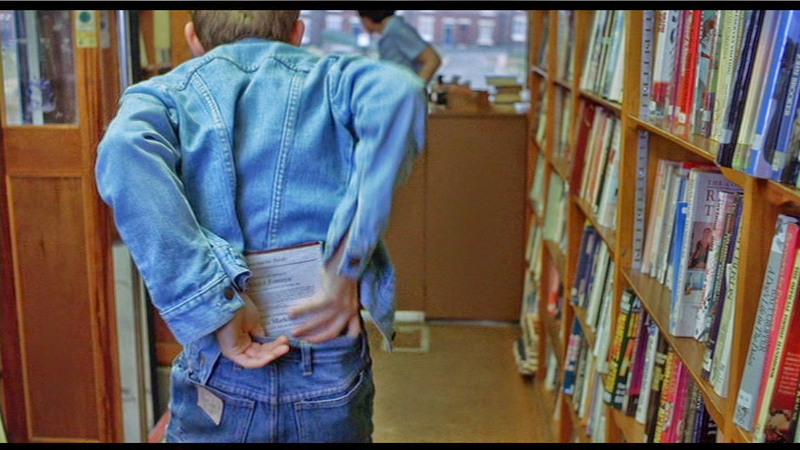 Billy, quick to take advantage of slight ease of the watching eye of the librarian, turns to grab the ballet book from the shelf and jams the book into his too-small-for-size jeans. The T. Rex song resumes. We feel the tension. The camera shifts point of view. For the first time, we see both Billy and the librarian in the same shot. 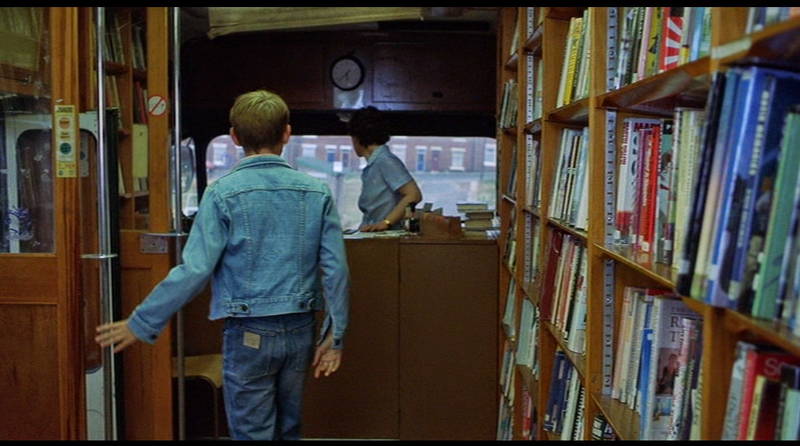 The shot is taken from the back of the bus, with Billy's back in the foreground and his attempt to stow away the book. We see the librarian distracted in the background, oblivious to Billy's "crime." The shot is meant to show us Billy's brief triumph over authority, thanks to a perverse rebuttal to the law (pun intended). The camera's perspective allows us to be happy for Billy as he successfully conceals the book and nonchalantly pretends to look at another shelf of books - and with a bit of prideful disposition, waves to the distracted librarian, "See you, then," he says and adjusting his shoulders, leaves the bus. As if nothing ever happened. In the following sequence, we see the importance of the library book and why Billy takes such a risk to get it. It is at this point the film shifts its focus. Up to this point, we as viewers see Billy as a mere curious boy, dabbling in dancing possibly out of boredom or lack of interest in boxing. But, at this point, after his retrieval of the ballet book, we begin to feel for Billy's intensity. 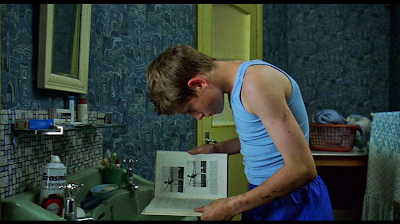 Propping the book on his bathroom stand, he practices the moves photographed in dull black and white. We see the inward drive. What I like about the scene is that it outlines perfectly the desire to do something you want to do despite the challenges inherent in the task. It is at this point in the film that we as viewers are completely allied with Billy and do not want him to fail. 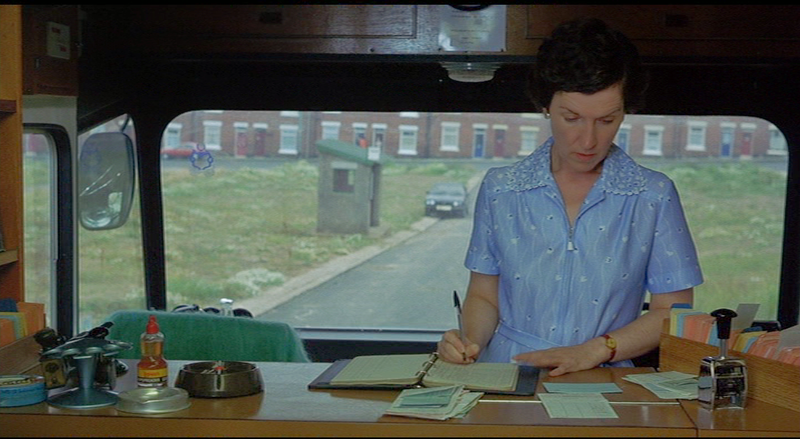 The scene, mixed with humor, is a witty take on the otherwise grim reality of the UK miner's strike of the 1980s. The central heart of the film: hope in adversity and the persistence needed to follow your will. Thanks. 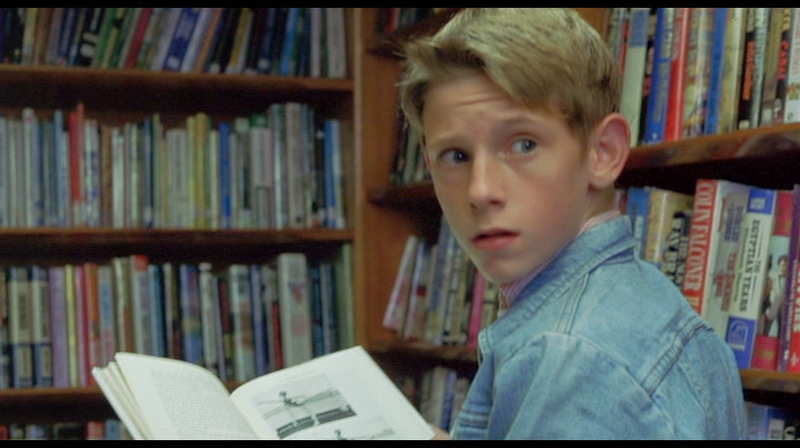 I see you are a Jamie Bell fan, Ted. Cool!